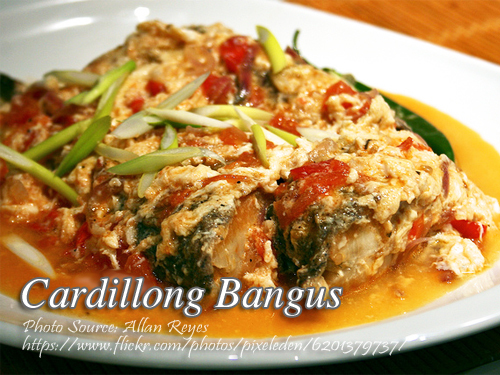 Cardillong bangus is fried milk fish sauteed in onion and tomatoes simmered with slightly beaten egg. This dish is very similar to sarciado dish where beaten eggs and tomatoes are combined. Bangus is very bony and there is a little effort when eating it whether fried or boiled because you have to remove the spiny fish bones before eating it. Good thing is there are already boneless bangus or boneless bangus belly that is already processed, packed and frozen sold in supermarkets. To cook cardillong bangus; Sprinkle a little salt on bangus. Set aside for 1 hour. Fry until golden brown. Saute garlic until brown, add onion and tomatoes then add the patis. Stir for 3 minutes and pour in water. Season with MSG. When it boils, add fried bangus and cook for 5 minutes, then stir in slightly beaten egg. Sprinkle a little salt on bangus. Set aside for 1 hour. Fry until golden brown. Saute garlic until brown, add onion and tomatoes then add the patis. Stir for 3 minutes and pour in water. Season with vetsin. When it boils, add fried bangus and cook for 5 minutes, then stir in slightly beaten egg.